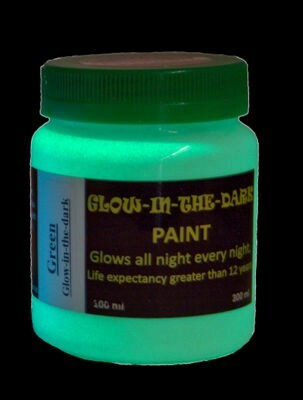 Brightest Glow In The Dark Paint for Interior and Exterior Applications. Charges in light and then glows in the dark for 12 hours. GID Green is the brightest glowing Glow-in-the-dark Paint and is used for safety and decorative applications. It charges in light then glows for 12 hours in the dark. In normal light the paint is a pale green color and then glows a typical lumo green color in the dark. GID Green is often the color of choice due it having a brighter glow than GID Aqua-blue. Bear in mind that many outdoor environments are not dark at night due to street lights, exterior house lights and even moon light (when full moon). If the area is not dark then the glow result may not meet your expectations. If you have seen pictures of "glow paint" on plant pots or pathways and the glow looks as bright as a light then the pictures are not of glow paint; they are either edited pictures, are items with battery operated LED lights under the surface or are UV Paints with an Ultra Violet light shining onto them. If our paints could do this then they would have replaced electrical lights in many applications. Usually applied with brush or roller but airless spray can also be used. We have seen excellent, very uniform, results when sprayed with airless spray. Air Spray equipment is not recommenced for this paint as it is too thick. As the paint is thick it is quite likely that brush or roller marks will remain. These are, however, not visible when the paint is glowing. Some dilution with water prior to use will reduce the brush and roller marks but after dilution the active particles will tend to settle so regular stirring may be required. You will get a better result thinning the paints with our Flow Control than with water. This can be found under product category "Marbling and Pouring Art Acrylics".